1. Heat the oven to 400ºF/200°C. Toss the grated cheese with the herbs and sprinkle into cookie-sized rounds on a baking sheet. 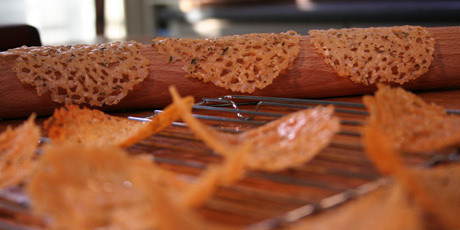 Bake until the cheese melts and bubbles into lacy disks, 5 minutes. Remove from the oven and shape quickly, bending over a rolling pin. Serve. Or, cool and store in an airtight container until serving.